In 1932, the Philadelphia Museum of Art’s curator of decorative arts, Joseph Downs, organized a large exhibition focused on industrial design. Its title, Design for the Machine, pointed to the exhibition’s focus on modern manufacturing and the aesthetic challenges and opportunities it presented to designers. 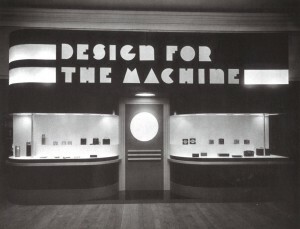 Many of the objects and mock interiors in the exhibition fell under the minimal functionalist aesthetic championed by European modernist architects and designers, but other works—like this shop front designed by prominent industrial designer Walter Dorwin Teague, or models of ocean liners, automobiles, and locomotives—referenced the visual language of Art Deco, particularly the “streamline moderne” style. Widely published and lauded in the national press, the exhibition represented a major exposure for Philadelphia-area arts patrons to the new ideas and growing energy of industrial design and mass manufacturing. Philadelphia Museum of Art Library and Archives, record no. 1932DM_ShopF. French-born, New York-based industrial designer Raymond Loewy began his career as a window designer for department stores, but would go on to achieve great fame for his work in the arenas of automotive, railroad, and aviation design, as well as consumer products and corporate branding. Loewy’s relationship with the Pennsylvania Railroad (PRR) began in 1934 and lasted until the early 1950s, with his office contributing designs for everything from locomotives to dinnerware and napkins for the PRR’s dining cars. 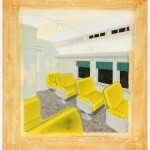 This drawing shows a proposed design for a refit of a commuter car interior in the popular “streamlined” style that the PRR and other railroads adopted in the 1930s. The contoured armrest panels, colorful upholstery, and linoleum flooring were meant to convey an overall impression of speed, efficiency, and modernity. While this scheme appears to have remained at the conceptual stage, it illustrates the extent to which the PRR saw design as a key aspect of its business, particularly as it faced growing competition from other modes of transport. 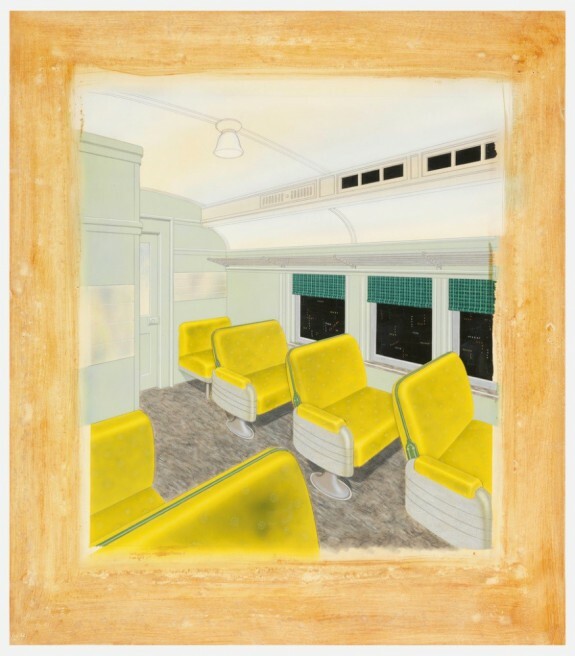 Drawing, Interior Color Treatment for “MP-54” Coach Passenger Car, May 26, 1936; Designed by Raymond Loewy (American, b. France, 1893–1986); airbrush and watercolor, gouache, brush and metallic paint, graphite on paperboard; Mat: 55.2 x 48.3 cm (21 3/4 in. x 19 in. ); Cooper Hewitt Smithsonian Design Museum, 2012-1-1. 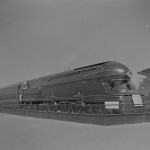 The S1 Class was a massive experimental steam locomotive developed by the Pennsylvania Railroad (PRR) in the later 1930s, intended as a prototype for an eventual replacement of its aging fleet. 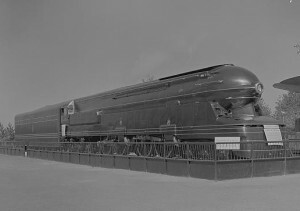 The largest passenger locomotive ever built, the S1 sported a highly streamlined “cowling” designed by the New York-based industrial designer Raymond Loewy. 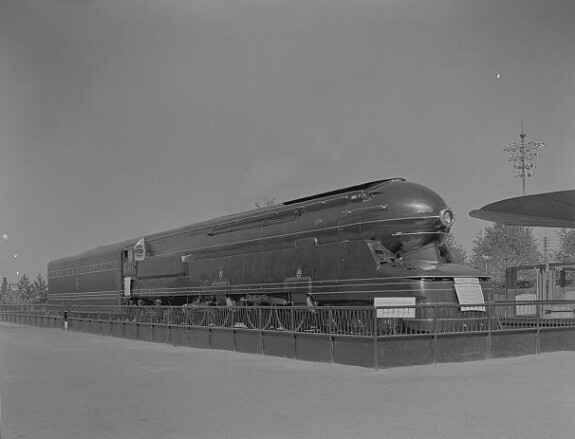 While the purported reason behind the locomotive’s streamlined cladding was the aerodynamic advantages when traveling at high speed, it was as much an effort to impart an aura of modernity and excitement to rail travel, an industry that was struggling under increased competition from automobiles and commercial aviation. With growing competition from other modes of transportation in the 1920s and 1930s, large railroad companies like the Pennsylvania Railroad worked to project an image of stylishness and modernity through the design of their stations, locomotives, and passenger cars. Art Deco styling, with its connotations of speed and technological progress, often represented an attractive choice. Suburban Station in Center City Philadelphia, built around 1930, was a collaboration by several architectural firms (including Chicago-based Graham, Anderson, Probst & White and the Philadelphia-area Thalheimer & Weitz) and carried many features of the Deco style, including decorative geometric metal- and stonework. 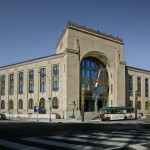 The building entrance in this photograph is located on Sixteenth Street at JFK Boulevard. The underground station remains in use, serving the regional commuter lines. Art Deco styling made prominent appearances at several interwar international exhibitions held in American cities, underscoring the optimistic notions of technological and social progress that characterized these large public events. 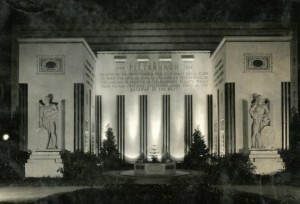 At the 1926 Sesquicentennial International Exposition in Philadelphia, close on the heels of the influential 1925 Paris exhibition, the gargantuan Pennsylvania State Building (designed by Ralph Bencker) and the smaller pavilion representing Pittsburgh—the only municipality to build its own exhibit at the exposition—by Pittsburgh architect Edward B. Lee (1876–1956) were prime examples of modernized classicism, appearing all the more progressive for their contrast with the romantic, retrospective colonial-style buildings surrounding them. Many of the moderne buildings at the exhibition celebrated the commercial power and technological innovation of United States industries. One prominent thread of Art Deco fused the historicism that had long characterized American architecture with the increasingly prominent vogue for abstract, geometric forms, exemplified by the Fidelity Mutual Life Insurance Company headquarters. Completed in 1928 by the architecture firm Zantzinger, Borie, and Medary, the building sat across from the classical, rigorously historicizing Philadelphia Museum of Art, completed in the same year. Zantzinger, Borie, and Medary had also contributed to that large project, overseen by prominent architect Horace Trumbauer, but the Fidelity Mutual building (today acting as an annex for the nearby museum) was much more flexible in its interpretation of the architectural motifs of the past. Its asymmetric massing, oversized entrance arch, and stretches of unadorned limestone marked the building as conspicuously modern despite its many ornate flourishes. Built in 1931 and designed by the Philadelphia architectural firm Ritter and Shay, the Market Street National Bank is a representative example of the Art Deco style that characterized so many tall buildings of the 1920s and 1930s. The vibrant, multicolored decoration on the street-level façade and the building’s upper stories was rendered with modular architectural terra cotta components, which were both economical to produce and highly durable. Some of the ornamental designs referenced the Beaux-Arts tradition, with volutes, swags, and garlands playfully reinterpreting familiar classical forms, while other elements were more geometric, abstract, and explicitly modern. The building shared its distinctive stair-step or ziggurat form with numerous other skyscrapers from the period; this was primarily the result of municipal laws intended to ensure access to light and air for the crowded streets below, but also provided opportunities for the designers to articulate the different masses of the tall building with inventive brickwork and other architectural ornament. The building is located at Market and Thirteenth Streets, across from the northeast corner of City Hall. “Art Deco details, upper stories,” Market Street National Bank Building, c. 1933. Library of Congress, Prints & Photographs Division, Historic American Buildings Survey Collection, HABS PA,51-PHILA,484—2. 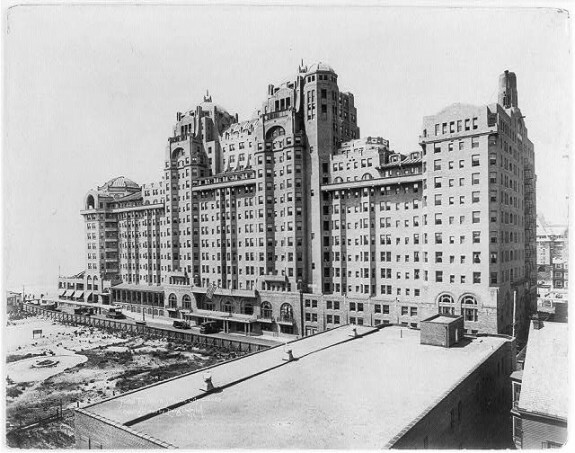 The Hotel Traymore was a large resort complex in Atlantic City, New Jersey, renovated and expanded in 1914–15 by the Philadelphia architect William L. Price and his partner M. Hawley McLanahan. Price was an outspoken advocate of the Arts and Crafts movement, helping to found two craft-focused art colonies in the Greater Philadelphia region, but from the early years of the twentieth century to his death in 1916 his own architectural practice increasingly incorporated explicitly modern materials and forms. 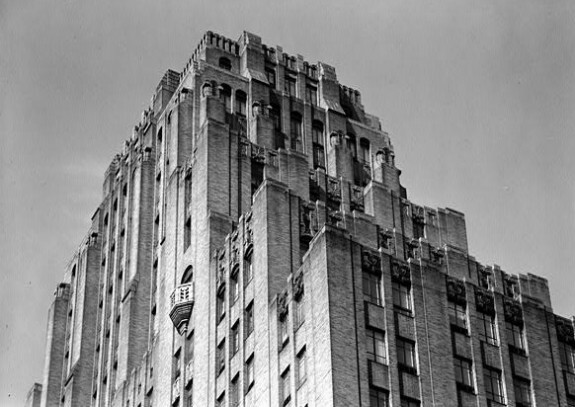 The Traymore was an important antecedent for Art Deco buildings of the 1920s and 1930s. 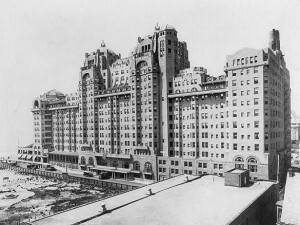 It was an early example (along with Price & McLanahan’s other hotel projects nearby in Atlantic City) of the structural use of reinforced concrete, a technological achievement that enabled the hotel’s impressive size and paved the way for the massive skyscrapers of the Art Deco period. Likewise, its restrained, selective use of architectural embellishment—with decorative motifs mostly accreting around street level and upper stories—established a model approach for the ornamentation of tall buildings that many later designers would borrow. 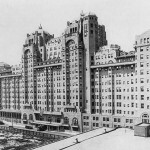 Despite the Traymore’s initial success, however, it was a victim of Atlantic City’s decline in the mid-twentieth century and was demolished by implosion in 1972. Philadelphia has dozens of examples of Art Deco design in skyscrapers and smaller buildings, with a concentration along or near Walnut and Chestnut Streets in the heart of the city. Among them are Market Street National Bank (1319 Market Street; built 1931), the Sun Oil Building (1608-1610 Walnut Street; built 1928), and the Architects Building at 121 S. Seventeenth Street, completed around 1930. Many of the new venues and businesses that flooded America’s cities in the 1920s and 1930s made use of the Art Deco idiom, charged with a spirit of newness that accompanied the rapid spread of technologies like electricity, telephones, aviation, and the personal automobile. A distributed infrastructure of theaters and cinemas, automats and eateries, and other commercial spaces helped foster the phenomenon that historians have termed “mass culture,” where the interwoven dynamics of accelerated consumption, industrial production, and widespread media visibility all contributed to major shifts in American lifestyles and cultural forms. Like other major American cities in the 1920s and 1930s, Philadelphia was an epicenter for the exuberant strain of architecture and design activity that came to be known as Art Deco. Fueled by the area’s economic importance and increasingly urban character after the First World War, designers, corporations, and manufacturers all engaged in a broad search for a distinctly American form of design appropriate for the modern age. Art Deco is generally considered to have its roots in the French moderne style that arose in the early twentieth century. Although the style contained great variety, moderne furniture, decorative objects, and interiors were generally characterized by restrained, simple forms (some inspired by classical or otherwise traditional precedents) rendered with luxurious materials like exotic wood veneers, precious metals, or sharkskin. 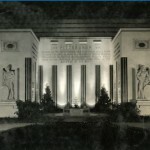 The 1925 Exposition Internationale des Arts Décoratifs et Industriels Modernes in Paris celebrated this approach, showcasing the most modern of Europe’s decorative arts. While the United States did not participate in the exhibition, the event was heavily covered in the press and had a palpable impact on the design professions. American Art Deco was also influenced by avant-garde European art styles, particularly Cubism, that attempted to capture the rapid technological, economic, and societal changes of the interwar period. 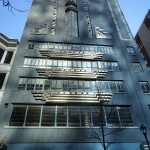 The larger umbrella of “Art Deco” (a term applied retroactively by later scholars) included a diversity of simultaneous and even contradictory stylistic approaches, from luxurious upscale goods and interiors inspired by the French moderne to the more populist, mass-market products of the machine age that arose after the onset of the Great Depression. 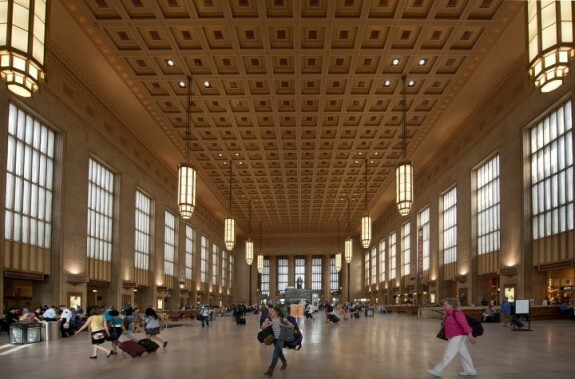 But it was precisely this heterogeneity that made Art Deco such an intriguing and widespread vein of design, and the creativity of interwar architects, designers, and manufacturers would leave a lasting legacy on the built environment of Greater Philadelphia. Philadelphia architect William L. Price (1861–1916) and his firm Price & McLanahan, although best-known for their involvement in the Arts and Crafts movement, signaled some of the directions later Art Deco architecture would take with their 1916 expansion of the Traymore Hotel in Atlantic City, New Jersey, into a massive resort complex with an innovative concrete structural system. The hotel combined bold architectural massing, radically modern construction techniques, and a rich decorative program—elements that would come into play in many Art Deco buildings of the 1920s and 1930s. 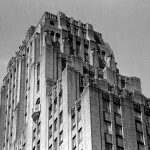 One of the building types most closely associated with Art Deco was the skyscraper, a triumphant icon of construction technology, American financial might, and the growing cultural power of large cities. One of the earliest Art Deco skyscrapers in Philadelphia proper was the Young Men’s Christian Association (YMCA) Armed Forces Building (today a luxury apartment building, The Metropolitan) on Fifteenth Street near Arch Street in Center City. Completed in 1928 and designed by the New York–based architect Louis Jallade (1876–1957), the tower featured distinct zigzag banding on its upper stories and a colorful cornice of modular geometric terra cotta decoration. 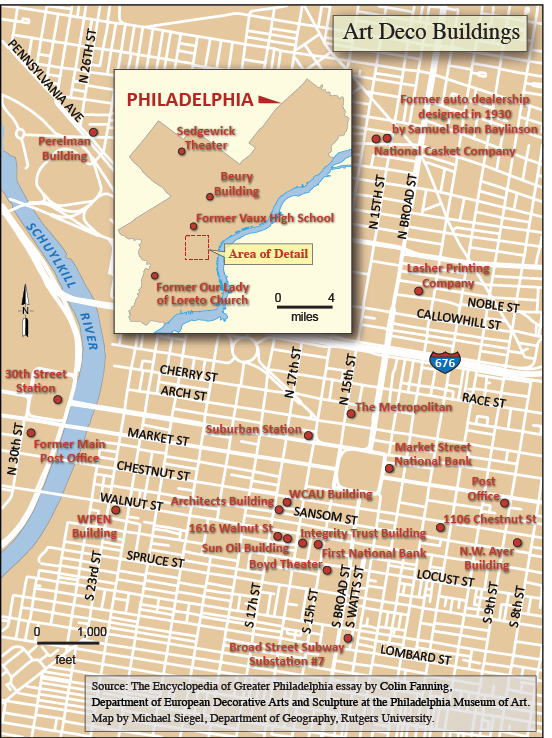 Other notable examples of similarly adorned high-rise Art Deco buildings in Philadelphia included Ritter and Shay’s Market Street National Bank (1319 Market Street; built 1931); Tilden, Register & Pepper’s Sun Oil Building (1608-1610 Walnut Street; built 1928); and the Architects Building at 121 S. Seventeenth Street, completed around 1930. Designed by the prominent French-born, Philadelphia-based architect Paul Philippe Cret (1876–1945), who in this later phase of his career moved sharply away from the Beaux-Arts style toward the moderne, the Architects Building housed numerous architectural offices and attested to the central role of the profession in shaping the city’s modern landscape. Large corporate or institutional clients turned to Art Deco in an attempt to project an image of modernity as well as an optimism in technological and cultural progress. 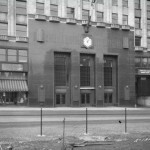 Philadelphia’s WCAU Building (1931) at 1622 Chestnut Street, the first radio-station headquarters in the country to be purpose-built, also expressed the excitement of new material treatments for architecture. Architects Gabriel Roth (1893–1960) and Harry Sternfeld (1888–1976) created an unusual façade that incorporated crushed glass and decorative metalwork in brass, copper, and stainless steel. The Fidelity Mutual Life Insurance headquarters by the firm of Zantzinger, Borie & Medary (completed 1928; today the Perelman Building of the Philadelphia Museum of Art), meanwhile, was a lower-rise building whose decoration took inspiration from classical forms, highlighting how interwar designers reworked and simplified historical styles to signal a modern spirit. 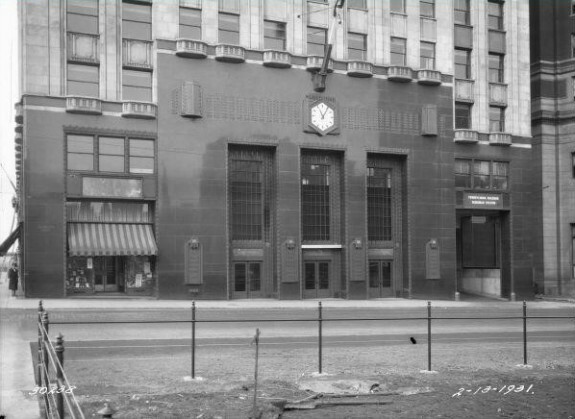 A grand example of a civic building in the Art Deco mode was the United States Post Office (built 1931–35 by the firms Rankin & Kellogg and Tilden, Register & Pepper in partnership) at the intersection of Market and Thirtieth Streets. The limestone-clad building was organized much like a factory to accelerate the mail-distribution process, and its rich but selectively applied decoration visually reinforced the ethos of speed and efficiency. In addition to these large, expensive corporate and civic buildings, a concurrent thread of Art Deco was manifest in smaller-scale, more populist kinds of architecture like theaters, storefronts, and eateries. Business owners who wanted to mark their establishments as up-to-date and stylish deployed moderne decoration and new materials. Architect William Harold Lee (1884–1971) designed several theaters around greater Philadelphia, while Ralph Bencker (1883–1961) designed many of the region’s numerous Horn and Hardart’s automat cafeterias. And despite Art Deco’s close association with big-city life, it was not solely an urban phenomenon: The main streets in smaller communities in surrounding parts of Pennsylvania, New Jersey, and Delaware often sprouted “modernistic” buildings as businesses competed for customers’ attention. American notions of progress were often tethered to transportation as a particular arena of invention. Amid the rise of widespread car ownership, the gradually increasing accessibility of air travel, and the luxurious experience connoted by the great ocean liners—all modes of travel that frequently carried their own Art Deco styling—railways in particular felt a need to project an image of modernity to remain competitive. Railway station architecture was one prominent vehicle for such design activity. The exterior entrances of Suburban Station (built 1930) in Center City Philadelphia appealed to the spirit of the age through exuberant decorative metalwork. 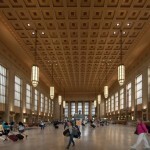 Although Philadelphia’s 30th Street Station (built 1929–34 by Chicago firm Graham, Anderson, Probst & White) sported an exterior in the Beaux Arts tradition, its grand interiors epitomized the simplified moderne approach to classicism. In addition to self-consciously modern station architecture, the Pennsylvania Railroad experimented with the design of locomotives and rolling stock to reinforce their connotations of speed and modernity. Locomotives like the iconic S1 Class and the interiors of passenger cars designed by the prominent industrial designer Raymond Loewy (1893–1986) typified the vogue for “streamlining” that emerged with a force in the 1930s. Characterized by smooth contours, rounded forms, and a general horizontality often heightened by bands of “speed lines” (whether the object was meant to be mobile or not), streamlining was one material manifestation of a widely held sense that the modern world was running at a faster pace than in previous periods. Despite the interwar romance with speed, a primary motivator for the streamlining trend was economic. In the 1930s, companies turned to professional designers to imbue products with expressive qualities without significant factory retooling. Some critics saw these attempts to stimulate consumer desire through novelty as blatantly commercial, or even morally dangerous, but streamlined products and vehicles proved hugely popular in the marketplace. Consumers in greater Philadelphia encountered the products of the young field of industrial design, whether streamlined or in a more minimal “machine” style, in contexts both commercial and cultural. 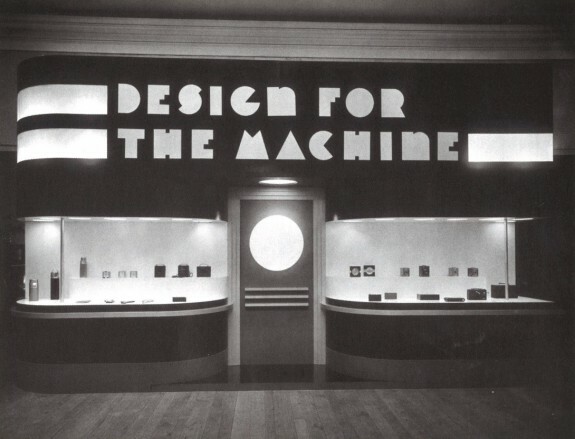 Department stores were a key venue for the dissemination of new ideas in design, while arts institutions like the Philadelphia Museum of Art played a prominent role with exhibitions like the 1932 Design for the Machine: Contemporary Industrial Art. 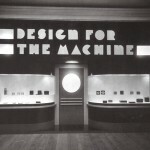 The museum displayed an array of furniture, appliances, and other home goods designed to take advantage of modern manufacturing techniques, and the installation opened with a mock storefront by noted New York industrial designer Walter Dorwin Teague (1883–1960) that echoed the Art Deco architecture appearing across the region. While many of the most famous firms, designers, and manufacturers featured in these displays were based in New York or Chicago, some production took place around Pennsylvania, capitalizing on its long industrial history and transportation connections. The prominent Westinghouse Company was based in Pittsburgh, while the Stehli Silks Corporation—best-known for its “Americana Prints” collection (manufactured 1925–27), commissioned from artists to capture the “modern spirit” of the country—maintained a large mill in Lancaster, Pennsylvania, until 1975, with operations peaking in the 1920s. On the more exclusive end of the textile spectrum, Philadelphia’s House of Wenger (active 1903­–38) created luxurious clothes responding to the taste for streamlined modern forms in fashion as well as home goods. Mass-produced goods and the growing prominence of the industrial design profession came to dominate the decorative arts under the Art Deco umbrella, but there remained a thread of high-end making that prized individual craftsmanship and traditional techniques while it adapted to twentieth-century sensibilities. Samuel Yellin (1885–1940), a Philadelphia ironworker deeply rooted in the Arts and Crafts tradition, was one such exemplar, producing architectural elements like gates, railings, and grilles in the 1920s and 1930s that complemented the design language of the thoroughly modern buildings for which they were commissioned. As the Depression marched on and construction and manufacturing slowed ever further, federal involvement in the arts through the Works Progress Administration (WPA) and Public Works Administration (PWA) supported some later buildings and works in the Art Deco vein. 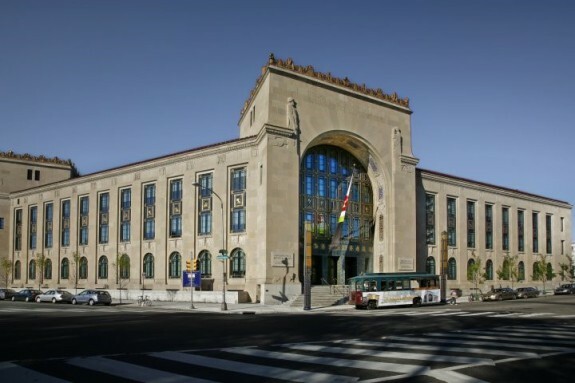 Harry Sternfeld’s post office building at Ninth and Market Streets in Center City (built 1937–41) incorporated relief sculptures by Edmond Amateis (1897–1981) in the moderne style shared by many other WPA-funded artworks. Similarly, the Edward W. Bok Technical High School (built 1935–38) was a PWA-supported project with restrained geometric Art Deco ornament. However, a number of overlapping factors contributed to the slow decline and eventual end of Art Deco’s fashionability, including compounding economic difficulties in the 1930s and finally the onset of World War II. Stylistically, avant-garde attention in the design professions shifted toward the more strictly rationalist “International Style,” modeled after the progressive theories of European modernism. 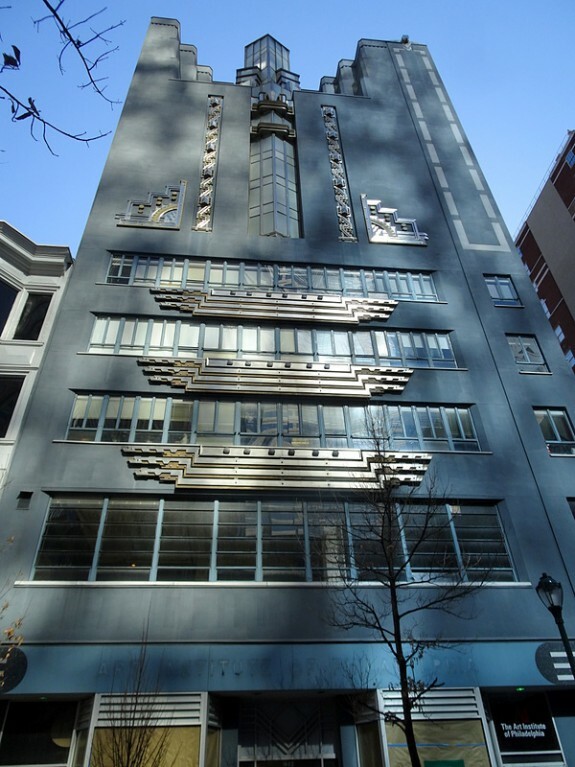 As a result, Art Deco was increasingly seen as overly decorative and retrogressive. It wasn’t until the 1960s that scholars began to reevaluate the style as a distinct expression of the economic and cultural complexities of the interwar United States. Philadelphia’s own Art Deco legacy reflects this national history in microcosm, from the commercial circumstances that birthed the city’s first skyscrapers, to the rise of radio and other forms of mass entertainment, to the WPA’s attempt to stimulate the Depression economy through art and design. In the twenty-first century, Philadelphia’s Art Deco buildings remained in somewhat mixed condition: many have been demolished or stripped of their ornamental architectural details. 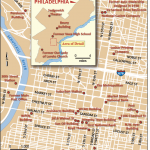 Others, however, retained their characteristic Deco styling, contributing to the distinctive character of many Philadelphia neighborhoods. 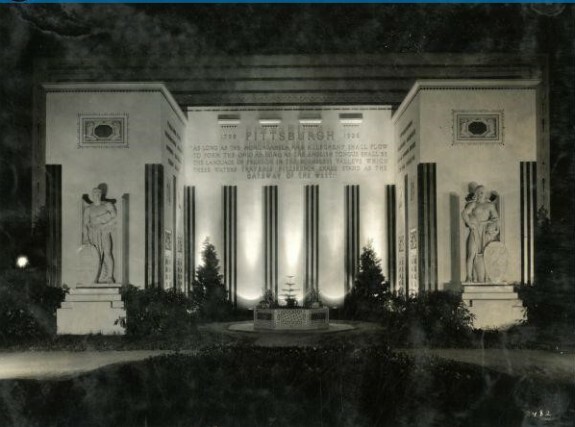 Accordingly, organizations like the Preservation Alliance for Greater Philadelphia continued to actively advocate for Art Deco’s importance to the region’s built heritage. Philadelphia is peppered with examples of Art Deco-influenced architecture. Benton, Charlotte, Tim Benton, and Ghislaine Wood, eds. Art Deco, 1910–1939. London: V&A Publications, 2003. Breeze, Carla. American Art Deco: Architecture and Regionalism. New York: W. W. Norton, 2003. Donofrio, Mark Edward. “Preserving the Neighborhood Theaters of William Harold Lee.” M.A. thesis, University of Pennsylvania, 2010. Dooley, David Warren. “The Geographic Diffusion of Art Deco Architecture in Delaware.” M.A. thesis, University of Delaware. 1999. Gordon, John Stuart. A Modern World: American Design from the Yale University Art Gallery, 1920–1950. New Haven, Conn., and London: Yale University Art Gallery and Yale University Press, 2011. Hiesinger, Kathryn Bloom. Collecting Modern: Design at the Philadelphia Museum of Art since 1876. Philadelphia: Philadelphia Museum of Art, 2011. Hillier, Bevis. The World of Art Deco. Minneapolis: The Minneapolis Institute of Arts; New York: E. P. Dutton and Co., 1971. Johnson, Stuart J. American Modern, 1925–1940: Design for a New Age. New York: Harry N. Abrams and American Federation of Arts, 2001. Lesieutre, Alain. The Spirit and Splendour of Art Deco. New York and London: Paddington Press, 1974. Meikle, Jeffrey L. Twentieth Century Limited: Industrial Design in America 1925-1939, 2nd ed. Philadelphia: Temple University Press, 2001. Thomas, George E. William L. Price: Arts and Crafts to Modern Design. New York: Princeton Architectural Press, 2000. Paul Philippe Cret Collection; William L. and Walter F. Price Collection; Price & McLanahan Collection; Howell Lewis Shay Collection; and Zantzinger, Borie and Medary Collection, The Athenaeum of Philadelphia, 219 S. Sixth Street, Philadelphia. Raymond Loewy archive, 1903–1982, Hagley Museum and Library , Hagley Museum and Library, 298 Buck Road East, Wilmington, Del. Raymond Loewy papers, Library of Congress, Manuscript Division, 101 Independence Avenue SE, Washington, D.C.
Philadelphia Museum of Art Archives, 2600 Benjamin Franklin Parkway, Philadelphia. Harry Sternfeld Collection, Samuel Yellin Collection, and Zantzinger, Borie and Medary Collection, Architectural Archives, University of Pennsylvania, 102 Meyerson Hall, 220 S. Thirty-Fourth Street, Philadelphia. 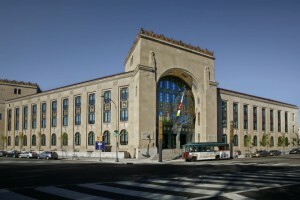 Former United States Post Office Main Branch (currently regional headquarters for the Internal Revenue Service), 2970 Market Street, Philadelphia. Former Fidelity Mutual Life Insurance building (currently the Philadelphia Museum of Art’s Perelman Building), 2525 Pennsylvania Avenue, Philadelphia. Suburban Station, Sixteenth Street and JFK Boulevard, Philadelphia.